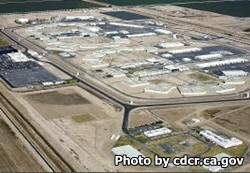 Calipatria State Prison holds inmates from a minimum to a maximum custody level. This facility is also used by immigration and Naturalization to incarcerate immigrants who have been detained and are close to being released. Although originally designed to hold much less, the facility now holds over 4,100 inmates. Calipatria State Prison has many vocational studies that inmates can take advantage of. These skills taught for free to the inmates can give them a range of skills that they can use to earn an honest living once they are released. Some of the programs currently offered are auto body and painting, consumer electronics repair, carpentry, electrical, and masonry. Visiting is on Saturdays and Sundays from 8:30am-2:30pm, many people arrive around 8am-8:15am and wait in line to visit. Their are four holidays inmates may also have visits on, they are New Year's day, July 4th, Thanksgiving and Christmas day. If your inmate is on lockdown or has non-contact visitation, you must call to setup a visiting appointment or you can schedule a visiting appointment online here.